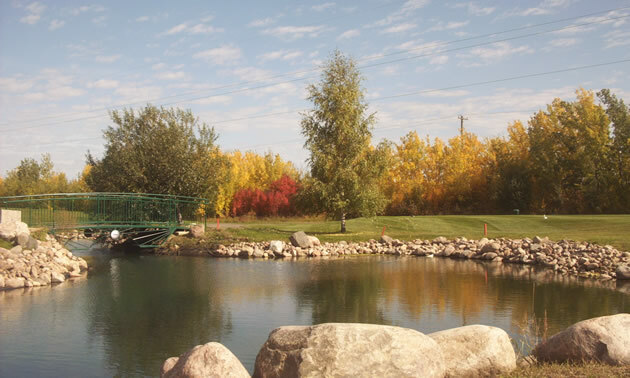 Bonnyville Golf and Country Club, situated in central Alberta between Cold Lake and St. Paul, features an 18-hole golf course, full practice grounds, and a licensed lounge where patrons can enjoy a hearty meal at the end of their golf day. 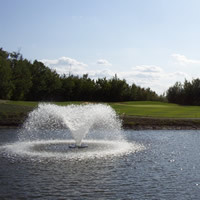 Sitting at the heart of the Lakeland area, the club is surrounded by beautiful scenery including the area’s namesake lakes, which draw in people from all over the province. This abundance of water in the area contributes to the wealth of plant life on the course, primarily found as a thick brush of large spruce and poplar trees. Be sure to keep your ball in play, though, because once you’ve misfired into the brush, it will prove pretty tough to get it back. As well as some tough greenery, be sure to watch out for those water hazards on the course—especially on the signature Hole 10. The water feature on the 500-yard par 5 is a large creek located in front of the green, and can often offer a spot of challenge to over-zealous players. The challenge of the hole is worth the view, though—a 30-foot waterfall can be seen flowing into the recently expanded creek from the side of the fairway. Five kilometres southwest of Bonnyville on Highway 28. 64, tied for by Randy Gallop and Zennon Wiebe. Oilmen’s Tournament June 6-7, Seniors’ Open June 18, Men’s Open July 5-6, Junior Open August 14, Ladies’ Open August 16, Moose Lake Scramble September 6-7. Men’s Night Wednesday, Ladies’ Night Thursday. There are a variety of things you need to keep your eye out for in order to keep your A-game up and your golf score down at Bonnyville.